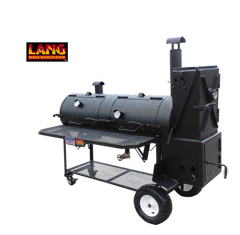 Lang BBQ Smokers Announces the new HYBRIDS, smoker cooker and charcoal grill in a single unit. July 19, 2012, GEORGIA –Lang BBQ Smokers® has announced its newest line of products – the Hybrids. Available in either 36″ and 48″ sizes, the Lang BBQ Smokers®Hybrids combine the reverse flow smoker cooker with a chargrill for a full range of cooking – smoke, warm and grill. The convenient size, functionality and portability features are best suited for backyard, patio and outdoor kitchens, as well as competition cooking teams on the go. The single cylinder design of the original Hybrid contains both the smoker cooker with offset fire box and the chargrill, but they are independent of each other. The Hybrid can be upgraded to a Deluxe which includes a warmer. Original models come equipped with standard mild steel cooking racks, or can be upgraded with stainless steel cooking racks. The Hybrid is available as left- or right-handed models and features high quality 1/4″ steel construction throughout. In addition, all Hybrids are portable with either rolling patio cart mounts with back wheels or wagon wheels mounts with hubs and bearings. The difference is the ability to swivel with a front axle with the wagon wheels. “We’ve responded to the popularity of this design by making the Hybrids a regular production model. The Hybrids are mobile, agile and convenient – and best of all offer a championship –grade smoker capability for both backyard grillers and competition teams,” adds Ben Lang, owner of Lang BBQ Smokers®, headquartered in Nahunta, Ga.
Hybrids are currently in production with orders being filled daily. For pricing and product specifications, please visit our website www.LangBBQsmokers.com or call 800-462-4629.